Folks always ask us if they can install bamboo flooring over concrete – the short answer is “of course you can!” There are, however, some necessary guidelines that will help you ensure your bamboo or eucalyptus installation is sound and will look and feel great for many years. There are two basic methods for installing over concrete: the floating method and the glue down method. We’ll go into details below. The slab you’re installing over must be aged for at least 60 days. Always perform an approved slab moisture test prior to beginning work to ensure that the slab is no overly wet. If floating a floor over a slab, just ensure to use a quality 3 in 1 underlayment, which will serve as a vapor barrier. If gluing down, most adhesives that contain a vapor barrier can handle up to 15 lbs of moisture per square foot being emitted by the slab, however if your tests determine the moisture emission is higher than that, you may need to choose an adhesive with unlimited moisture protection. The glue-down method can be used for solid or engineered bamboo flooring. The most important factor is to ensure you’re using an , and the trowel that is used specifically for that adhesive. In this method, you will adhere the bamboo flooring directly to the concrete slab. Moisture control will come from the adhesive you use which acts as a sound reducer to boot. If you think your slab is overly wet, you will want to use a calcium chloride test to check the moisture emissions. Most vapor barrier adhesives have an upper moisture limit so you’ll want to ensure your adhesive is rated for the amount of moisture being emitted by your slab. Trowel the adhesive directly onto the concrete floor, working in sections and lay the bamboo planks directly on top. Make sure you have a tube of Bostik Adhesive Remover Wipes handy to clean up glue spills asap, as letting the glue cure on top of the flooring planks will damage the finish!Follow the manufacturer’s instructions as far as dry time and when the floor can be walked on. The floating method is most commonly used with engineered or click lock bamboo flooring. This type of flooring clicks together like a puzzle and is quite easy to install. Unlike the glue-down method, this installation requires you lay down a moisture barrier first (), then install the floating floors directly on top. Note that using solid bamboo locking flooring may limit your runs of flooring to 15 feet if you live in an area with unstable humidity and you don’t have humidifiers or dehumidifiers… which means you may have to install t-moldings at break points – if you use engineered bamboo flooring your runs can extend up to 25 feet without a t-molding. The glue-down method is quite a bit messier, but the elasticity in the glue allows the flooring planks to expand and contract naturally. The floating floor method is very easy for DIYers to do themselves and is not messy, but there are limits to the “runs” (successive distance) of flooring you can have, with solid click lock options the limit is 15 feet and with engineered click lock options the limit is 25 feet. As discussed in the first paragraph above, ensure to choose an adhesive that has a moisture limit that is compatible with the amount of moisture being let off by your concrete. This seals the concrete and protects your floor from moisture. The next most important tool is your trowel. You want a trowel that has been designed to work with your adhesive. If you’re not sure, just check the label on the flooring glue pail, or call your flooring manufacturer. This is crucial to maintain the correct spread rate on the slab, so that moisture isn’t allowed to seep through and cup your floors. Before installing the bamboo be sure to fill any holes or cracks in the concrete slab with a concrete leveling compound applied with a trowel. Once this compound is completely dry, sweep your floor well to remove any remaining dirt and debris. Your concrete slab may be cured but that doesn’t necessarily mean it’s clean, so before you do anything else, give it a thorough sweeping or vacuuming to get up any dust and debris. Depending on how dirty your slab is you may have to give it a good scrub with soap and water. If you should find you need to scrub it just be sure to give it another 24 hours to dry before installation. Most importantly, you will want to ensure that your slab is level before installation, whether through the use of self-leveling compound, or grinding down bumps. 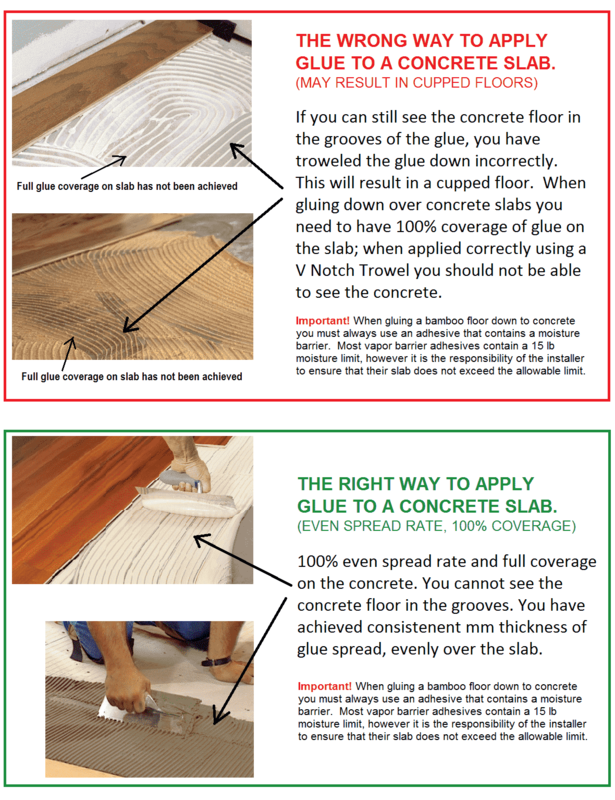 Don’t start spreading glue all over your floor until you determine the best starting point in relation to any step downs where stair nosings may be needed, and other site-specific considerations related to moldings and flooring plank direction. If you’re gluing down the floor and decide to take a break longer than 6 hours or continue the next day, remember not to leave glue too far out under the last plank. Because when you come back to start gluing planks in the next day, if the glue is too far out from the bottom of the plank, you won’t be able to slide the next plank in to continue your installation! Also, keep in mind that wood and planks are *usually* laid parallel to the longest run in the installation. It’s important to mention up top that most adhesives dry in less than a few hours so you never want to apply more than you‘ll be able to cover in that time. That doesn’t mean you should skimp on the adhesive, because you shouldn’t. It simply means cover small sections of the floor at a time but use a liberal amount of glue in each section. Furthermore, using the correct V Notch Trowel is crucial to ensure the proper spread rate and coverage on the slab. Once you’ve spread some glue in your starting point, go ahead and scrape the top of it with the notched side of your trowel. This creates grooves in the glue and helps your planks grab hold. Make sure to use adhesive remover towels to wipe up the glue off the top of the planks *as you’re laying the flooring* so none of the adhesive gets on top of your planks. If the glue dries on top of your planks it will ruin the finish. It’s really important to use spacers when gluing down a floor because without them each row you lay down will push up against the first row, and then your first row gets squeezed up tight against the wall. If you were laying down your floor over a plywood sub-floor you could simply nail the first row in place. But since you can’t, it’s important you use spacers every six inches along the planks to ensure the first row will stay in place. After you’re done laying your first row and you’ve come to your last plank, you’ll want to measure the distance between your last plank and the wall and then subtract ¼-1/2 of an inch for the expansion gap. Saw this bit off your last plank and lay it down. Perhaps you’ve noticed other wood floors have used a random pattern when it comes to the seams. Bamboo and eucalyptus floors just look more natural this way. To achieve this look you’ll want to start your second row by placing a long board beside a short one and vice versa. Once you’ve finished this second row, use 3M/Scotchguard #2080 for Delicate Surfaces tape and tape across the seam between your first and second row to hold them in place while your adhesive dries. You’ll repeat this process throughout the room making sure to use those adhesive towels to wipe excess glue that has squeezed between the boards. Once all of your boards are down, taped and wiped, allow the adhesive to dry for 6 hours. Once your floor is completely dry you can nail your baseboard to the bottom of your walls to cover those expansion gaps. You did make sure to cut for those gaps, right? Once that’s done the only thing left to do is show off your new floors and take all of the credit. I had Echo Forest Natural Stranded Bamboo applied to my cement slab 6 months ago.. Now the boards are buckling at the outside walls. Worst at the sliding door..Is rhere any way to fix this ? Or does the hole floor have to come up.? I’m sorry to hear you’re having problems with your floor. We recommend that you contact the manufacturer of your floor, as well as your installer, as there are a multitude of reasons that cause hardwood floor issues similar to what you’re experiencing, including . If you want to get an outside opinion, we highly recommend hiring an NWFA-certified inspector, you can find them on this page. We wish you the best of luck!